DivXG400 allows Matrox G4x0 (and perhaps also NVIDIA GeForce users) users to work around choppy playback and unability to use DVDMax with some DivX, MPEG4, WM7, WM8 (and possibly more) clips. 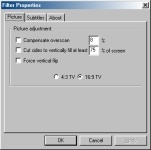 DivXG400 also supports image geometry adjustment and displays subtitles (SubViewer 1.0, SubViewer 2.0, SubRip, MicroDVD) and output them to TV. Version 1.91 adds support for SAMI, Sub Station Alpha 4.0, JACOsub, DVDSubtitle and VobSub subtitle file formats. Improved FPS detection in case of "secretive" codecs, like DivX 4/5. Automatic TV output format selection. Added support for VobSub 7 subtitles. No flipped image using Elecard MPEG decoder anymore. Fixed remaining time OSD malfunction. Image doubler of small clips for better subtitle quality.